I feel blessed to live in beautiful South Florida. The weather is glorious, but what makes it exciting, is the multi-cultural population, with a large Cuban influence. Cuba is known for its delicious cuisine, and pork is a big part of their tradition. I want to share with you my Pork Loin Chops Cuban Style. I make it with a Cuban signature marinade, using sour orange, which can be found in most grocery stores. It is known as the Mojo sauce. Equal parts of regular orange, and lime juice can be used, if you cannot find the sour orange in your area. You can also buy it in a bottle, labeled Mojo sauce, but it’s not as good as homemade. 1) In a large bowl, season pork liberally with salt and pepper on both sides, then add the remaining ingredients. Mix well, and let it marinate for a minimum of 30 minutes to infuse all the flavors. The longer it marinates, the more intense the flavors will be. 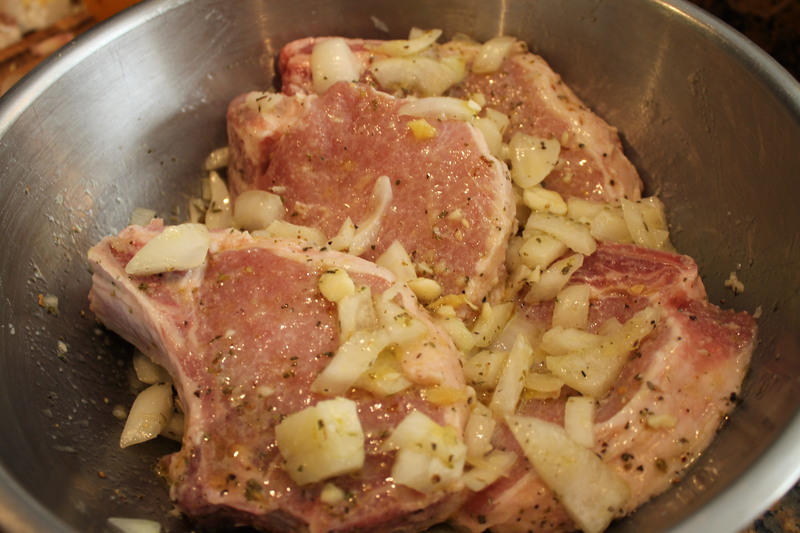 When you are ready to cook, remove pork chops from marinade, shake them a little to remove some onions, but some will stick to the pork chops. That’s what you want! You will be pan-frying them on high heat and they will create a nice caramelization. Save the marinade and the rest of the onions. 2) Over medium-high heat, in a large heavy-duty skillet (with a lid), heat up 1 tbsp. olive oil, brown the pork chops, 2-3 minutes on each side until they obtain a golden brown color. Next, add the marinade to deglaze. Cover, reduce the heat to medium-low, and simmer for about 10 – 12 minutes, or until the pork is cooked through. Do not over cook the pork, as it will get tough. Serve them with arroz y frijoles, (rice and beans.) I also made a nice avocado salad as an accompaniment to this fabulous meal. This dish calls for a nice chilled beer, if you don’t drink beer, a nice white wine of your choice will do. Traditionally, Cubans enjoy a roasted pig on Christmas Eve, called Noche Buena. They gather with loved ones to have a good time, and are passionate about dancing to the rhythm of salsa. Celia Cruz was the queen of Cuban music and entertained us for decades. If you are into cigars, you already know that Cubans make by far the best ones. They are also known for their coffee, called cafecito, (Cuban espresso) which is similar to an Italian espresso, with the addition of sugar while it is brewing. There are a varieties of ways in which they enjoy their coffee, and it is part of their daily social activities. Most of all, I love all my Cuban friends, because they know how to live the good life. I hope you have enjoyed this blogpost, and will attempt to make this awesome dish in your kitchen. Happy Cooking from My Kitchen To Yours! Salud! Cheers!